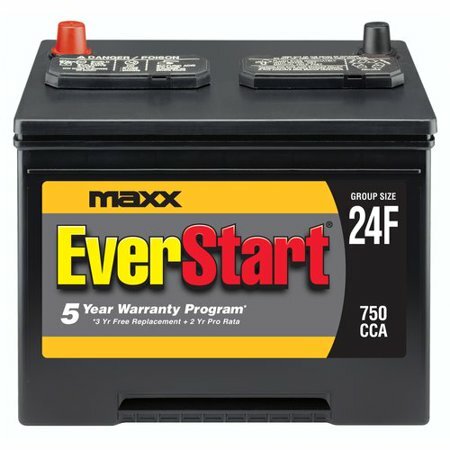 Power up your vehicle with this EverStart Maxx Lead Acid Battery. With a warranty of three years free replacement and two years prorated, this battery will not let you down! I installed a Everstart battery in my Altima seven years ago. It was 15 degrees (F) this morning and the car started fine. My wife was worried about the battery being so old so I had it tested. It still had 441 CCAmps (new rating 700 CCA). But the report still said it should be replaced so I bought another one just to keep the Mrs happy. We plan to keep the car. It's only 24 years old with 246,000 miles. I told the clerk "see you in 2024". Bob H in NW Indiana. one of the better batteries available. The only problem is I had to make adjustments to secure battery but its great start on first try and a very good battery better and a lot less in price compaired to die hard or interstate .